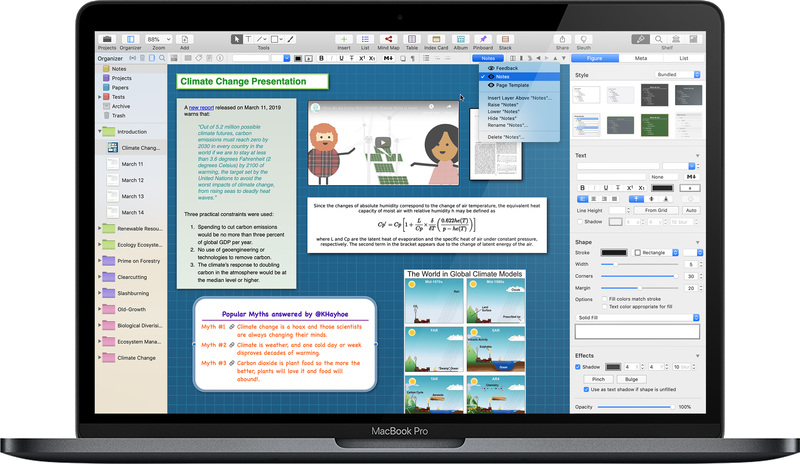 Your favorite application for note-taking and brainstorming is now even more powerful. Curio 13 adds more productivity features with new support for dark mode, figure layers, cross references, integrated equation editor, focus mode, markdown additions, and much more! More details below. Curio 13 requires macOS High Sierra or Mojave. What can Curio do for you? In Curio, create a project to represent a real-world project that you’re working on. Next fill it with everything related to that project including notes, images, PDF’s, documents, web links, multimedia, and much, much more. You can place this information anywhere on Curio’s freeform idea spaces. Or use Curio’s integrated mind maps, lists, tables, index cards, albums, pinboards, and stacks to organize your data into powerful collections. Anything placed into Curio can be associated with meta data such as tags, flags, checkboxes, priorities, ratings, resources, and start/due dates and durations for easy searching and task management. The key point is that everything related to your project is stored, managed, and tracked within a single project file using a single, well-integrated application. You’re not juggling a mess of files scattered about your hard disk with a disparate suite of apps. We invite you to join the thousands of customers around the world who use Curio for information gathering, brainstorming, and creative exploration. Download Curio and begin your 2-week trial with our bundled Welcome to Curio guided tour, documentation, and sample gallery to learn how you can be more productive with Curio. Subscribe to the latest news from Zengobi including announcements, product updates, and special offers. With thousands of customers we have an incredibly diverse audience. What will you do with Curio? 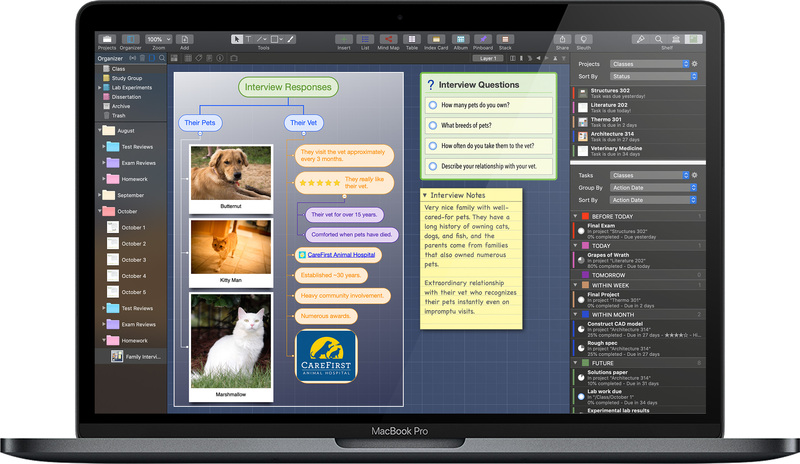 Full-featured mind mapping with styles, arrangements, boundaries, and more. From simple styled lists to complex hierarchical lists, numbered or bulleted. Create styled collections of photos or documents with optional captions. Index and note cards are perfect for organizing and shuffling ideas. Styled tables with full support for row and column headers and footers. Made for brainstorming sessions, collect ideas into freeform groupings. Track your tasks, Kanban-style, either manually or automatically sorted. Choose the productivity features you need. Existing customer? Purchase an upgrade! Dark mode support on macOS Mojave. Freeform notebook environment with our flexible and innovative idea spaces. Rich text figures with support for bundled and personal figure styles. Documents and multimedia embedded and aliased files, images, PDF’s, audio, videos, Mail messages, web links & views. 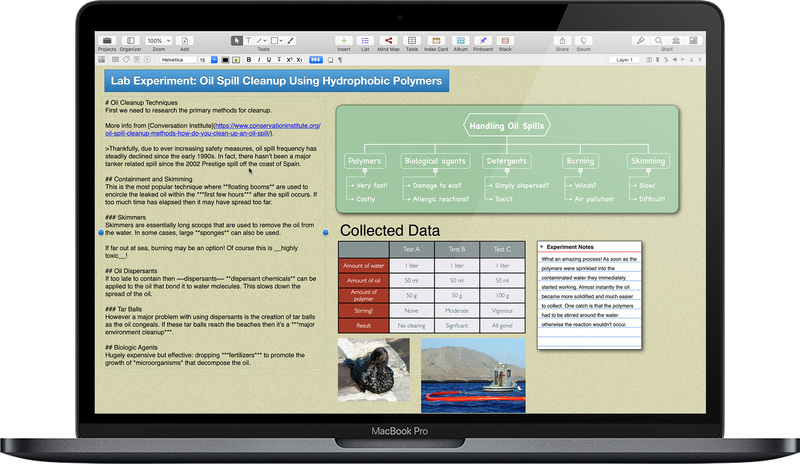 Integrated collections including mind maps, lists, tables, index cards, albums, pinboards, and stacks. Flowcharting shapes for idea graphs, diagrams, and prototyping. Sticky lines with styles & arrowheads; straight, curved, or orthogonal. Record audio and video notes. Searchable meta checkmarks, percent complete, start/due/duration/done/added dates with smart date calculations, tags, priorities, ratings, resources, notes, actions. Import/Export as text, image, PDF, HTML, CSV, OPML, and popular 3rd party mind map formats. Integrated equation editor for LaTeX, AsciiMath, or MathML rendering. Focus mode to help you concentrate on specific figures or branches. Markdown rich text rendering, plus extensive import and export. Reusable templates and stencils, plus Stencils shelf for quick access. Brushes and pens allow freeform sketching with graphics tablet support. Evernote integration for quick access to your notes in the cloud. Sleuth and the new Sleuth shelf for easy, one-click Internet research. Organizer sections for independent divisions in larger projects. Sync tasks to Calendar & Reminders. PDF Table of Contents in exports. PDF Mirror live export of your project. Spread PDF to spread the pages of a PDF across multiple idea spaces. Figure layers allow for more flexible layouts and arrangements. Cross references, with custom types like Agree and Evidence, can be created between figures, idea spaces, and web locations for more organized research. Master figure styles & stencils, master idea space styles & templates, and master markdown styles for dynamic updates throughout a project. Status shelf for easy cross-project task tracking at a glance. 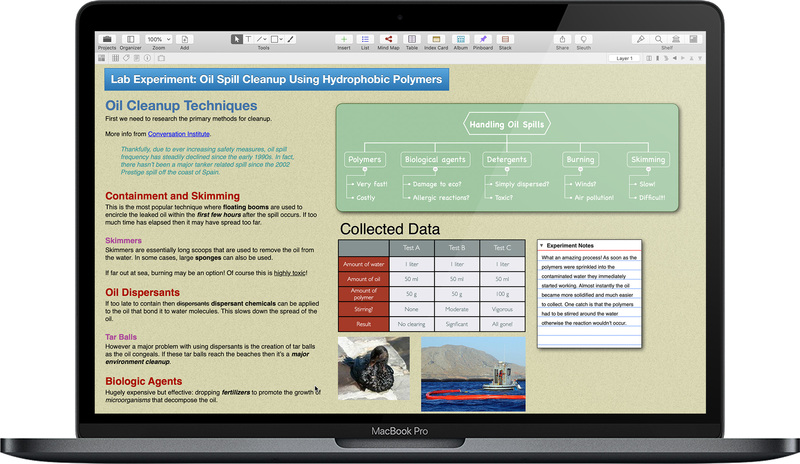 Presentation mode for group brainstorming or sharing sessions. Regular expressions support when searching in the Search shelf. Project password for project security. Automatic project backups for scheduled safekeeping. External project library to support Spotlight searching of project assets. External repositories for sharing styles, stencils, and templates with workplace colleagues. While Curio’s license agreement allows an individual to use a single license key on multiple machines, such as a home and work Mac, if you have multiple users that want to use Curio, then a discounted multi-user license should be purchased. These discounts are automatically applied during checkout. Discounts on new licenses are available for qualifying staff, faculty, and students of accredited educational organizations. I certify that these academic credentials are true, complete, and accurate. If upgrading from a Mac App Store purchase then follow these instructions. ▸ Student or teacher? Click here to enter your credentials for an academic discount. ▾ Never mind, please dismiss the academic questions. We invite you to step through our Welcome to Curio project to explore all of Curio’s features! Curio 13 requires macOS High Sierra or Mojave. Curio’s License Agreement. Use the Finder to drag Curio from your browser’s Downloads folder to your Applications folder to install. Launch Curio to begin your 2-week trial with all Professional features fully enabled and available. Our bundled Welcome to Curio guided tour will automatically open showcasing Curio’s major features. It also includes the complete user documentation and a gorgeous sample gallery showing off what you can create in Curio. Purchase and enter a Professional, Standard, or Core license key based on the features you need and Curio’s interface will dynamically change to reflect that edition’s features. You can even start with one edition then move up to a more feature-rich edition by purchasing a crossgrade upgrade license. Once the 2-week trial expires, you can request an extension to your trial if you need a bit more time, otherwise Curio will enter into a simplified Reader mode, allowing you to continue using Curio for read-only browsing, printing, presenting, and exporting of Curio project files and contents. At any time you can still purchase and enter a license key to enable functionality. Friends and colleagues that don’t own Curio can take advantage of Reader mode to view projects you share with them.  You may also browse Welcome to Curio’s Getting Started and Documentation in PDF form, if you wish. An amazing suite of new functionality so you can be even more productive. By hugely popular request, Curio supports macOS Mojave's ultra-cool dark mode! Curio's window chrome, toolbar, inspectors, shelf, Organizer and other interface elements will now change dynamically based on the the system’s dark mode setting. Your idea space content will continue to follow the coloring and styles you’ve specified for your idea spaces and figures. On a related note, in addition to dark mode support, there are dozens of other interface enhancements in Curio 13 including collapsible inspector shelf panels. You’re a landscaper using Curio to plan a client’s new backyard. You create layers Site Plan, Evergreens, Deciduous, Shrubs, and Perennials each filled with figures, perhaps via stencils from your personal library. You’re a professor and you use layers to lay out Page Template, Problems, Answers, and Student Work. Distribute the project to your students and they can work in text figures already set up in their special layer without impacting the other layers, and peek at the answers if they need assistance. You’re a web designer mocking up a prototype website within Curio. By changing figures on a master idea space template’s Components layer, those changes propagate to each inherited idea space’s Components layer without touching any other layers. This incredibly powerful feature allows figures and idea spaces to support multiple typed cross-references to other figures, idea spaces, and even web locations, to encourage more accurate and organized research. Use built-in types, such as Source or Rebuttal, or create and use custom types such as Persona and Scene. Via the references adornment, or right-click context menu, easily jump back and forth between references and referrers. With a click you can instantly jump to a figure’s references which Agree or Disagree with its argument, or see all items that reference a particular figure as a Source. You can also use the Search shelf to find all figures which include any reference or just those with a specific reference type, such as Agree. You can now create and edit equations using Curio! Create and edit equations using LaTeX, AsciiMath, or MathML syntax. Previews are instantly rendered as you type your equation. Then the final equation is rendered in high quality PDF form instantly and securely via Zengobi’s server and inserted into your idea space. Focus on a specific branch in a mind map or list, or perhaps a particular figure on a busy idea space such as an album or text figure with a quick keypress. Instantly all other figures on the idea space will become transparent allowing you to concentrate on the task at hand. If the selected figures are parent figures in a hierarchical collection such as a list or mind map then any existing or new child nodes inherit focus as well. When you’re done, the same quick keypress turns off focus mode and everything is restored. Curio’s markdown functionality now includes support for block quotes and code blocks! We’ve added two new album arrangements to our existing arrangement, shown here in the first image. The second sample image demonstrates Curio’s new unpacked columns layout and the last image shows off our new row-based layout. Independent of a figure’s due date, you can now set either manually or automatically a figure’s done date, marking the date the task was actually completed. Figures also have an added date, which is set by Curio automatically when you add a figure to an idea space, but can be changed if you’re trying to mark a specific date of entry for note-taking or research purposes. These new dates can be used for sorting in lists, mind maps, and stacks, plus used as search criteria in the Search shelf. Faster access to figure stencils via the new Insert > Stencils menu. The Status shelf gains a new sorting popup, plus several display improvements. Lists now allow you to specify a start number. Figure enhancements include support for independently locking content, position, or both! Idea spaces pick up a new dotted grid style. Within idea spaces, you can now more easily insert space above or to the left. Major performance and technical improvements. Major code updates to better support Apple’s latest macOS releases. Plus dozens of other miscellaneous optimizations, tweaks, and fixes. View Curio 13’s release notes for all the details! What’s the difference between Pro, Standard, and Core? Want to request or contribute a video? Subscribe to our YouTube channel to learn about new video releases. Curiota is our free, out of the way, always available, menu bar app that allows you to quickly jot down ideas or take notes when inspiration strikes. Curiota also supports macOS Services, the macOS Share button, Save PDF to Curiota, a browser bookmarklet, and even AppleScript so you can easily send information from anywhere into Curiota. It can be used even if you don’t own Curio. However, combined with Curio you have a powerhouse combination since you can view, search, and access all your collected Curiota data from within Curio. 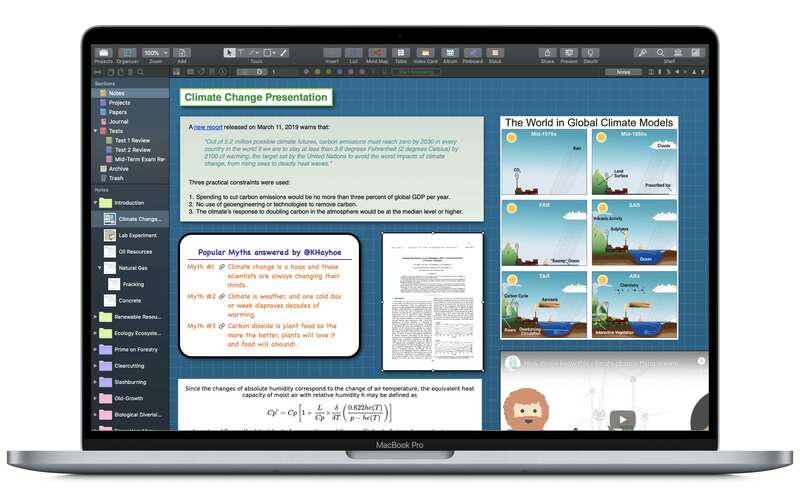 Learn more or download Curiota from the Apple Mac App Store.